I thought about posting this in the Tesla thread, but I think they already have enough to debate discuss. From the AAA. Their news release includes links to the study (I wish more organizations did that). EV driving range is a major concern for many. I’d hate to own one and be concerned it might leave me stranded on a cold day. EV driving range is a major concern for many. I’d hate to own one and be concerned it might leave me stranded on a cold day. Not to worry. All those 100,000+ soon-to-be abandoned gas stations will be turned into charging stations, complete with a rescue service to tow you to a comfortable waiting room so you can stay warm while you get a recharge. You just have to have some basic common sense with this tho. Many cars are >200 mile range now. How far do you drive each day? Does 30 or 40% matter? After all it is just a temporary loss. This may have mattered when you drove a Nissan LEAF with 70-80 mile max range. It is dumb now with 200+ mile cars. It has been very cold in Chicagoland recently ... you know what changed in my driving habits. Nothing at all. If people can handle their complicated finances situations/math then they can handle the math on range needed. I would imagine in hot weather using the air conditioner you would have somewhat diminished range also. Actually it is barely noticeable. 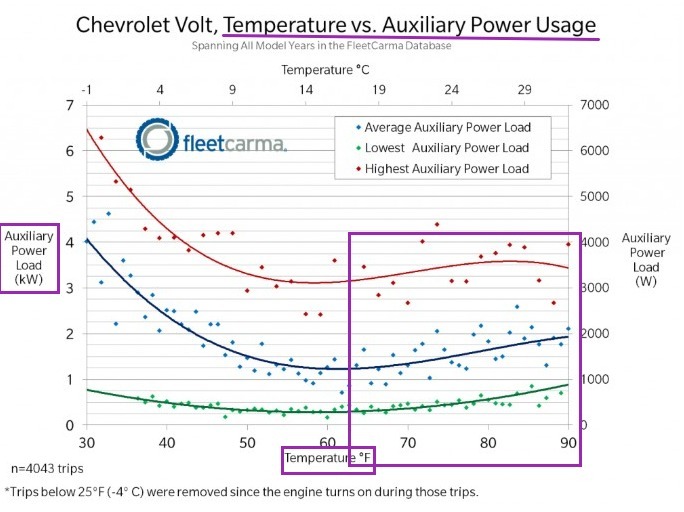 Electric based A/C is pretty efficient in cars (especially by comparison to heaters). The battery range in our Volts and Tesla hardly change with A/C. Have over 7 Chicago summers (80s/90s) of experience with this. Phoenix 105+F has more impact. True for my gas car when I lived there for a while too tho!! Keep in mind that this A/C tech has been perfected for quite a while now with Start-Stop gas cars that turn off at stoplights but still run the A/C. A 40% loss at 20F will be greater at 0 and even more at -25. It may be as high as 60% or 70%. If it's 70% at -25 then range becomes a serious issue. How much you drive on average is irrelevant. What is relevant is when you need to go 65 miles at -25 but you only have 60 miles of charge. You just have to have some basic common sense with this tho. As you know...common sense isn't so...well, common. 60% or 70%? What are you talking about and what are you basing this on? You must be making this up off the top of your head? I'm basing it on real driving experience in Chicagoland for the past 7 years. It was recently below zero. We have a significant number of electric cars around here because of higher than avg gas prices many dealer/centers (Volts, Teslas, etc). I see new ones daily. They work just fine in Chicago winters. Don't make illogical things up. If you have a 200+ mile electric car and you drive 65 miles then you have 135+ miles to spare. You are not going to lose 140+ miles out of your 200+ mile battery range. 70% is crazy talk. Base things on fact and real world experience not made up scenarios. Holy cow ... this seems true but I would expect financial savvy folks to be more critical thinkers! b) Most sophisticated electric cars also have battery warmers in them ... which uses electricity but that is way offset by the fact warming the batteries allows more energy to come out of them! I admit my sense is not common (DW reminds me frequently), and I don’t have an EV, so help me understand. If my commute is 60 miles each way and I have an EV with a range of 150 miles, if it underperforms >20% of the charge I’m in trouble, right? I'm sorry. I guess I don't understand why people don't want to learn and analyze with critical thinking? Sure you are but I guess you could make up any scenario you want to fit. If that was your scenerio then I would question your judgement on buying that car for your needs. What if you have a 238 mile Chevrolet Bolt (or 258 mile Hyundai Kona EV or 226 miles 2019 LEAF e+ or any PHEV) and you commute 60 miles each way and there is a Polar Vortex in Chicago. Would you be in trouble? No. What if you pre-condition your electric car in the garage with the door down to warm it (cabin/battery) up? No, and you are warm when you leave. Buy a car that is designed well that fits your needs and criteria. Published by the U.S. Department of Transportation, Bureau of Transportation Statistics, the Omnibus Household Survey, or OmniStats data, were based on a household survey of 1000 randomly selected households asked about their driving habits in the previous one month. We may not agree, but that doesn't mean either of us, or anyone else participating in this thread, is not thinking critically. Reasonable people can still disagree. The remainder of the top 10 longest-range EVs are rated at between 111 miles and 150 miles of operating range, which is still sufficient for all but long-range road trips; the U.S. Department of Transportation says the average commute in the U.S. is about 30 miles both ways. The 60 miles commute was made up to fit the example, but it is definitely not atypical. Many members here reported long commutes as one reason to ER. Your conclusion that the car was not a good fit (in my example) seems appropriate. I've perused many threads here on EVs and don't recall seeing any mention of significant loss of range in very cold weather. In fact, this AAA publication is the first time I've seen it mentioned. It's not clear to this critical thinker just how one should discover that important tidbit during the purchase decision. My Model 3 goes 310 miles in normal conditions. That's a lot of range even after the cold affects the battery. Over 90 degrees also is when the battery gets affected, but ever so slightly. I've never noticed it myself. ICE cars don't like bad weather either. So I think people would still need to match their EV choice to their expected commute and emergency needs. * EV choice means low range (<100); mid range (<200); or high range. * Emergency needs = how far to drive to get to kids or spouse in an emergency; worse/common case weather (remember many places have growing charging infrastructure). (example: my kid drives a long/high range vehicle but only was going to charge up to meet his normal driving needs (55 mile each way) but I reminded him to account for emergency runs to hospitials for spouse as an example ... so he bumped up his daily charge by another 10%). That is a pretty fair point. I'm not sure EV threads on *this* site are a great source tho. There are many articles and forums on EV/PHEVs out there if people are genuinely serious about purchasing an EV/PHEV, I would think they would do research at various places. Manufacturers selling in colder climates would be more telling/educational when buying. You could not go to a Tesla store/service center here in Chicago or in Canada and explain your driving without them telling you the range issues as an example. (GM dealerships would push you to a gas car <grin>). EV choice means low range (<100); mid range (<200); or high range. Pure EVs (Battery only) have battery icons next to them; otherwise they are Plug-in (grid) electric vehicles. Not an EV owner, but I think the problem is manageable if you have a garage to keep the car sheltered overnight. It keeps the battery from getting cold-soaked, plus you can plug it in to keep it charged and staying warm. If you park outside and leave the car covered in snow and have to dig it out, it's going to be tough. Even after having it towed to a charging station, it will take some time for the battery warmer to thaw out the battery before it can be charged. Charging lithium battery below freezing is a big no-no. You are talking about later fireworks. In fact, the car electronics won't let the battery get charged when it is cold. The article said a 40% loss at 20F. What's the loss at -25? It's definitely more than 40%, don't you agree? Okay...how much battery loss is there at -25? We already know it's 40% when it's a full 45 degrees warmer. 60% may not be out of line. At the very least more heat is required which will drain the battery more. "In the case of EVs, extreme cold shortens the range of the car’s battery. At -4F, a battery is at about 50 percent of its performance level." So...40% loss at 20F and a 50% loss at -4. Drop to -25 which is normal in many areas and if the decrease is linear then it's approaching a 60% loss. So, when I suggested 60% or 70% it wasn't "crazy talk". How does that work for the 40% of Americans who live paycheck o paycheck? Is -25F ambient temperature really normal in many areas? If you're thinking windchill, windchill isn't temperature.